Cool underwater cartoon scene shower curtains. Being inspired by the ocean I thought I would start creating some cartoons that could be used on our shower curtains. This is my first underwater themed design featuring a scuba diver and fishy friends. More designs will be added in the coming weeks. Customisable retro metal lunch boxes and other school items. Another new product line is our stainless steel lunch boxes. These are really cool and can be customised with your child’s name etc. For more school items do check out our “School fun” collection for pencil cases, rulers, bags and more. Some new trendy child night lights. I have expanded our range once again with some cute night lights which are great for any child’s room. Two designs so far – sheep and a fun frog. How to make money with Zazzle – the right way. Zazzle is a great tool for creating an extra income online, in fact some people make a full time living out of it which is one of my personal goals. Zazzler Elke Clarke is one of those people who has achieved financial success using Zazzle, and she has produced a couple of very helpful courses to guide those who are wanting to do the same. (Note the link below is an affiliate links and as such I do make a small commission but you pay no extra for the courses). Having said that I do want you to know that this is not something I have chosen to promote without having been a very happy customer myself. The link is below for you to check out. Is it a quick way to make money? No – from my own experience it takes time and effort to do, but the advantage is it is something that you can grow over time. Those designs and products you create become assets that can be sold multiple times which is effectively money while you sleep. If this is something you are wanting to do, then Elke’s courses could be of huge benefit to you in moving forward. I have done the 7 days to Success course and found it to be very helpful in clarifying what I needed to do to build my store, find out what sells and increase sales. I now have a clear plan and better way of doing this to reach my goals quicker than if I was working out everything on my own (and I am seeing an increase in sales as a result). Frillseeker cartoon funny lizard surfing. My latest creation is a funny lizard surfing and dodging the sharks. Great gift for the lizard lover and those who like a sense of the crazy. This design is available on a number of items including clothing, stickers and notebook. Cute and funny cards for birthdays and other occasions. Here is my growing card collection of with various designs available for purchase. Most can be customised with your own message too. 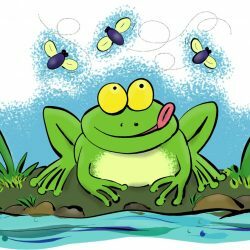 From hippos to fish, frogs to birds there is a nice selection that is added to on a regular basis.